the first of the mulberries. I first ate a mulberry two summers ago after discovering what I thought to be a tree full of them growing in a public park. 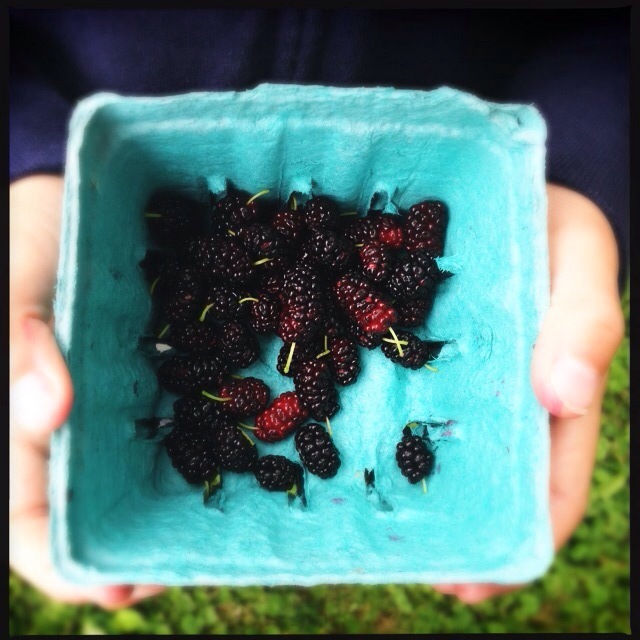 Any prior knowledge I had of mulberries centered around the Dr. Seuss book And To Think That I Saw it on Mulberry Street, which in my mind was one of the earliest books I read myself. I don't recall that book contained the eating or description of the mulberry, which is a less seedy, blackberryish berry that grows either on trees or bushes depending I assume on the maintenance of the plants and the locations they are found. What I do know now is that a fat, thumb-sized, perfectly ripe mulberry has no comparison in the berry world. The first taste of mulberry for me (after confirming with someone who knew what a mulberry was), wasn't really so sweet. Mulberries must be falling-off-the-tree ripe, and deep black - at least the varieties that I've seen here should be deep black. The reddish ones, or ones that need some coercion to detach from their tree, are sour or tart; they are seedy and not that pleasant. Last year's severe drought is blamed for just about everything bad in the Wisconsin food world of 2012... and what few mulberries I saw were tiny and I suspect gobbled up by the birds. But this year: sweet success. The clutch of public trees I had my sights on were prolific this year, still bearing as I check up on them every few days or so, ripening slowly as if to provide me desserts just as I need them. I made the first full pint of berries we found into a tiny batch of jam, a single jar that I've been enjoying on toast about every other day. 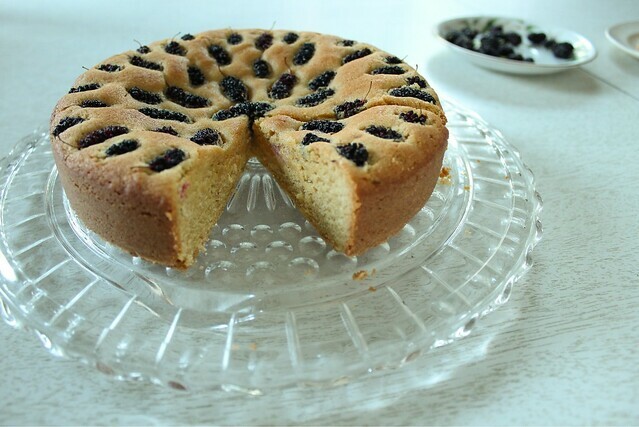 But when we checked the tree Monday and many more berries had ripened, I thought I should really celebrate by making a cake. I never need prompting to make a cake... but it helps that I had recently made one of my favorite summertime cakes ever - Dorie Greenspan's Dimply Plum Cake. Except the two pieces I gave some visiting friends, I ate that whole cake myself, and then had to refrain from making another. I made only a few well suited changes to Dorie's impeccable original recipe, chiefly adding coconut oil instead of another type of vegetable oil. Coconut oil and butter work together to provide an amazing texture, almost bordering on a softer version of shortbread. Playing around with the spices is only half the fun too. This cake is so endlessly adaptable, you could really do any kind of fruit, nut, or berry I would think. If you are a raw batter taster, as I am, I would heartily encourage you to taste this batter. It is billowy, silky, and downright indescribably delicious. 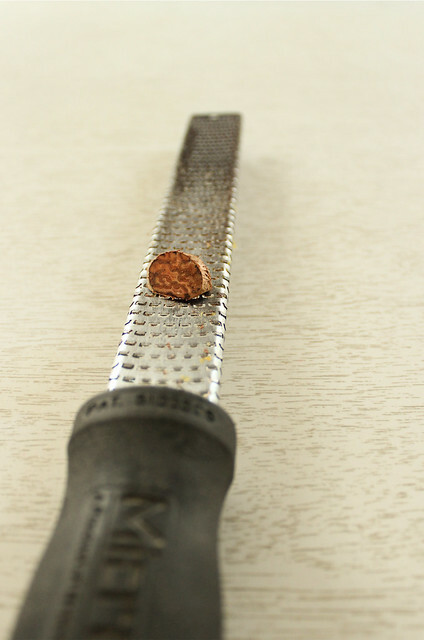 I tried to think of just one spice that could complement the flavor of mulberry, and settled in on nutmeg. It could be that a nutmeg heavy cake I had made for a Daring Baker challenge was lingering in my mind, and I grated in a good amount of it due to the happy memory of enjoying it. I'd see no reason why you couldn't fold the berries into the cake batter instead of arranging them on top, but I wanted to keep the spirit of Dorie's cake, and let the berries dimple the top. 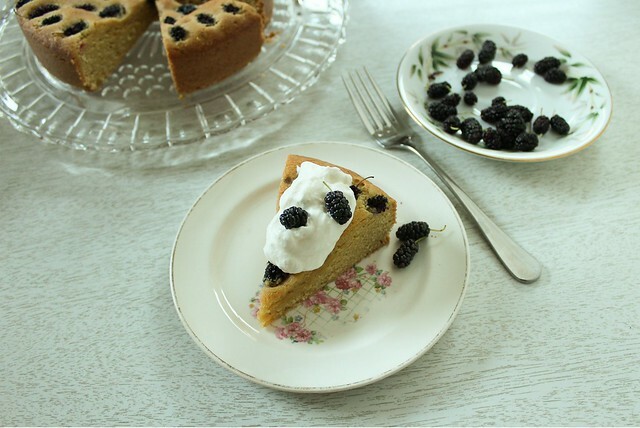 The cake is best served with just a bit of barely sweet whipped cream, and additional mulberries. Preheat oven to 350. Butter and flour an 8 inch round pan, I used a springform pan. In a small bowl, combine flour, baking powder, salt, and nutmeg. In a large bowl, beat the butter until light and fluffy, about 3 minutes. Add the sugar, and beat another 3 minutes until fluffy. Add the eggs one at a time, and beat a full minute after each addition. With the mixer on medium speed, blend in the coconut oil, lemon zest, and vanilla. Dorie says "the batter will look smooth and creamy, almost satiny", which is so apt I need to include her description. Taste it. It's wonderful. Finally, add the dry ingredients, and mix until just combined. 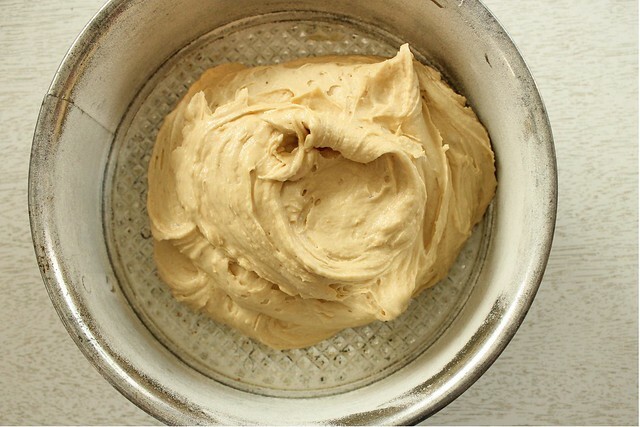 Before transferring the batter to the baking pan, use a spatula to be sure you've incorporated any dry spots. 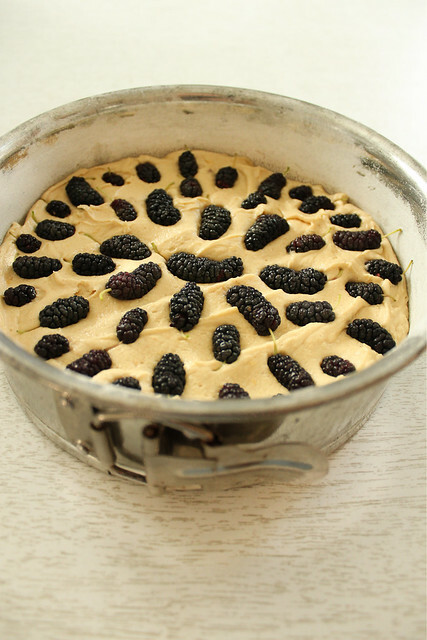 Smooth the batter into the prepared pan, and decorate the top with the mulberries. Bake for about 40 minutes until the top is nicely browned and a tester comes out clean. Cool in the pan for 10 minutes, then run a knife around the edge before unmolding it. Cool it right side up. Store the cake at room temperature for 2 days (it's moist, so will mold if you try to push it further), or coax another 2 days of longevity by storage in the fridge. The texture changes under refrigeration, which isn't bad, but you may wish to allow your slices to come back to room temperature before eating them. After the discovery of what mulberries looked like, I identified trees in nearly every park we frequented. Some trees are so big, I'd need a ladder and a friend to help glean. But fortunately, the best glut of berries to be found is right in my own neighborhood, and is low enough to reach - even for my kiddo. Just this week, we noticed another similarly sized tree hiding in plain sight, not far from the first... more than plenty for fresh eating and playing around with. Not much makes me happier than seeing my picky eater stained purple from picking and eating berries and excited to look for more. He even liked my cake, and now that he's finished off the last of the fresh mint ice cream (which is the best recipe ever, by the way), he may even help me to eat it. If I'll share it, that is.